Wanted – Experienced cyclists for NEW leisure cycle club in Ash. Home » Wanted – Experienced cyclists for NEW leisure cycle club in Ash. My role is to set up community cycle clubs in the Blackwater Valley, as part of a funded project and Ash is one of my target areas. I have started to offer taster rides in Ash, to engage with residents and weigh up the interest. Well the interest is definitely present, so the next step is find people to lead the club, lead the rides, etc. As mentioned I have funds to help with start-up costs, for equipment, training people, etc. However, a cycle club needs people to run it, so I am keen to reach out to experienced cyclists who might live locally, who might like to help build a club, coach others to do so, take locals on leisurely and fun rides, etc. 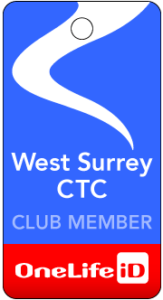 Set up by CTC, the club offers fun, leisurely, social cycling that is good for health and wellbeing. Rides should be local, off road, on quiet roads – short routes at a slow pace. This club wants to get people back on bikes and offer family rides too! In return – I can offer training in leading rides, bike maintenance and much more.